“If you can’t dip it in chocolate, it’s not worth eating!” That’s the slogan of the Chocolate F/X chocolate shop that we visited when we were in Niagara Falls this past weekend. 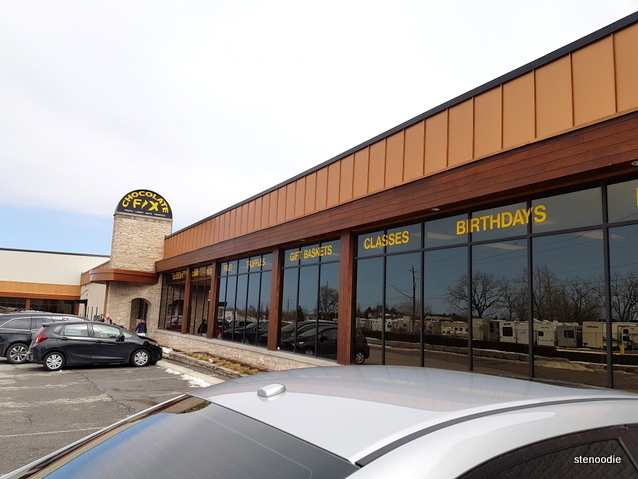 Chocolate F/X is actually located in the town of St. Davids but it’s only a 15-minute drive from the Falls or a 15-minute from Niagara-on-the-Lake. Since we received a voucher for two from the hotel for a free tour of this chocolate shop and factory, we decided to check it out. Their tours were every hour starting from 10 a.m. to 2 p.m. We called in before driving there to confirm our spot. Luckily, we didn’t have to reserve early since they definitely had space for us. We arrived early for the 1 p.m. tour so we browsed the chocolate shop and looked through the paneled glass into the chocolate factory until it was time to start the tour. There were definitely so many types of chocolates including solid and hollow chocolates molded into various shapes, chocolate covered nuts, walnuts, fruits, pretzel, and nearly anything else you could think of. When it was 1 p.m., a staff member led everyone on a 30-minute tour of the factory. We didn’t actually go inside the factory. First, the lady did a short lesson on where their chocolates came from including showing photos of the cocoa beans and a big block of raw chocolate as a sample. There were a lot of people in this tour including lots of kids (it’s a great tour for kids to learn about chocolate and to see it being made). We looked through the glass to see how the chocolates went from being dunked to achieving more layers of chocolate to the packaging and labelling area. On that day that we were there, they were preparing chocolate-covered jujubes. 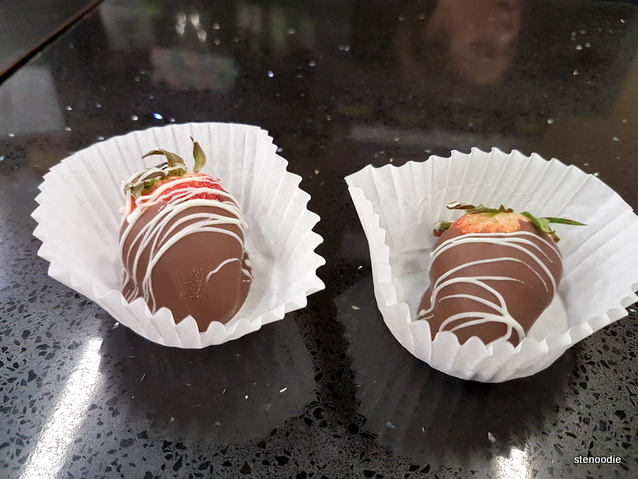 After the tour, we each received one chocolate covered strawberry or ice wine truffle. I chose the former choice. It was a really sweet touch (pun intended) to end the tour with this treat. They also had samples for chocolate covered goji berries, yogurt covered chocolates, and more from a small self serve vending machine. If you wanted to try other chocolates that they were selling, all you had to do was ask for it. This was a nice and sweet tour (again, pun intended 🙂 ). This entry was posted in New Experiences and tagged "If you can't dip it in chocolate it's not worth eating! 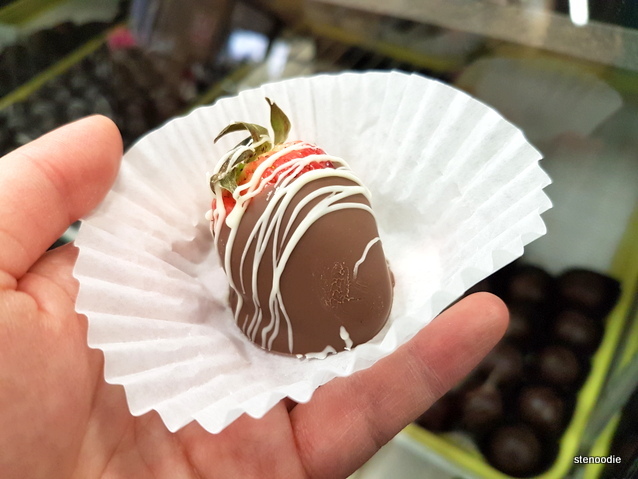 ", 335 Four Mile Creek Rd, Chocolate F/X, Chocolate F/X chocolate covered strawberry, Chocolate F/X tour and sampling, Chocolate Shop, chocolate tours, chocolate tours in Ontario, Chocolate-covered strawberries, food blog, foodie, kid friendly tours in Niagara, places to visit in Niagara, St. Davids, things to do in Niagara area, tours good for children. Bookmark the permalink.